Though cranberries are decidedly NOT local when you buy them here in northern California, there was no way I was going to skip the cranberry sauce at our Thanksgiving dinner. 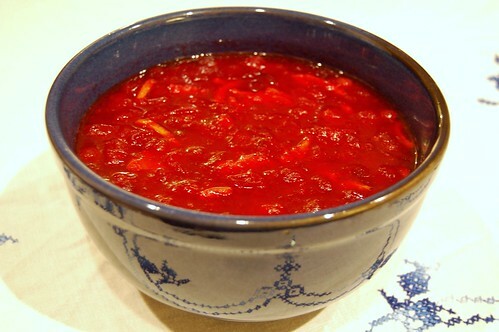 I consider that bowl of sweet, tart goodness to be the jewel on the Thanksgiving table. Food miles be damned this once! 1. 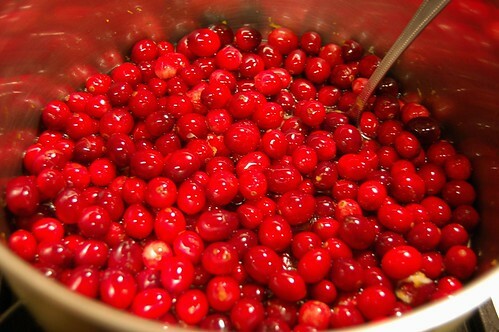 Wash the cranberries and pick through them to get rid of any that are soft or damaged. Bring the water and sugar to boil in a saucepan and stir to help the sugar dissolve. 2. Add the cranberries and orange zest and simmer (reducing the heat) for 7-10 minutes or until all the cranberries have burst. 3. Add the strips of orange peel. You can also add other things at this point if they sound good to you - dried currants, crystallized ginger, nutmeg, allspice, etc. 4. Remove from heat. Cool completely at room temperature and then chill in refrigerator. The sauce will thicken as it cools.